Apple’s MobileMe service can be a great deal. It enables you to back up your Mac, read and manage e-mail online, synchronize data between multiple Macs and iPhones (or iPod touches), and publish photos and Web sites. But MobileMe isn’t right for everyone. Perhaps you prefer to use calendaring, contact-management, or mail apps other than those that come bundled with OS X. Maybe you like other platforms for publishing photos and Web sites. Or possibly you simply balk at the $99-per-year subscription fee. Whatever the reason, you have many alternatives. None offer the one-stop-shop convenience of MobileMe. But if you’re willing to mix and match services, you can replicate MobileMe’s functionality but get greater flexibility and much lower cost. If you want to synchronize contacts or calendars between two or more Macs, access your contacts or calendars via the Web, or both, you have several choices. 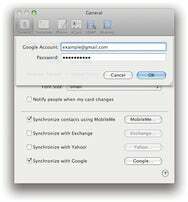 Address Book Sync Starting with OS X 10.5.3, Apple’s Address Book application can natively sync your contacts with Exchange, Yahoo, or Gmail Contacts, without requiring MobileMe. To set this up, open Address Book, choose Address Book: Preferences, and click on General. Select the Synchronize With Exchange, Synchronize With Yahoo, or Synchronize With Google option, depending on those you’d like to sync with. (You can select more than one, depending on which services you use.) Then, for each one you’ve selected, click on the corresponding button (for example, the Google button for Gmail Contacts), enter your user name, password, and any other requested information, and click on OK.
Then, to sync, choose Sync Now from the Sync menu in your menu bar. (If the menu isn’t already there, open iSync in your Applications folder, choose iSync: Preferences, select Show Status in Menu Bar, and close the window.) Unfortunately, unless you also have MobileMe sync enabled (and set to occur on a schedule), Address Book doesn’t sync with these other services automatically; you must initiate each sync manually. Without any extra software, Address Book can sync with Exchange, Yahoo, or Google’s Gmail Contacts. Google Calendar via CalDAV Thanks to Google Calendar’s support for the widely used CalDAV standard, iCal can connect directly with a Google-hosted calendar and sync all events automatically. If your calendar needs are basic, this makes a good solution, because it’s free and requires no additional software. However, you should keep in mind that Google Calendar has several limitations compared to iCal—for example, it doesn’t support to-do items and doesn’t sync directly with an iPhone or iPod touch. Also, you can’t simply sync an existing iCal calendar with Google Calendar; you must either start with a calendar that’s already on Google Calendar, or export an iCal calendar and import it into Google Calendar before you can sync them. If you decide to use Google’s CalDAV support, first go to the search giant’s Calendar Help page and download the CalDAV setup tool, cleverly named Calaboration. Launch Calaboration, enter the e-mail address and password you use for Google Calendar, and click on Sign In. Then select one or more of your Google Calendars and click on Add to iCal. From then on, iCal displays your calendars and syncs changes every 5 minutes (a setting you can change in the Accounts pane of iCal’s preferences, under Account Information). Another service, currently in beta testing, is Soocial. Its OS X software will sync your Address Book with a Web-based contact manager as well as (optionally) Gmail Contacts and several other services. Plaxo Plaxo is a social networking Web site that, among many other features, offers a Web-based contact manager and calendar; they can be synched with Address Book and iCal using the company’s free Plaxo for Mac software (available only to members). Plaxo has another handy trick up its sleeve, too: it can update your Address Book automatically when contacts who are also Plaxo members change their contact details. MobileMe’s iDisk gives you an online file storage area—by default, 20GB for e-mail and files combined—that you can access from the Finder or via the Web; if you turn on iDisk Sync, you get automatically synchronized local copies of all your iDisk files too. That said, several other services offer comparable features and, potentially, much more storage space. Examples include Evenflow’s DropBox (2GB free; 50GB for $99 per year or $10 per month); SpiderOak (2GB free; $10 per month for 100 GB; $10 per month each additional 100GB); and Sharpcast’s SugarSync (prices range from $2.49 per month for 10GB to $25 per month for 250GB). 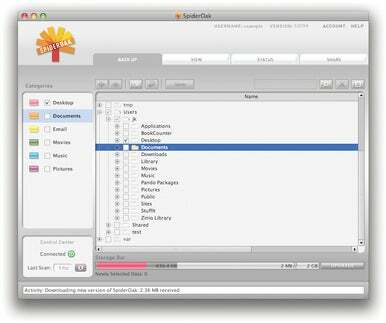 In SpiderOak’s configuration window, select one or more folders to sync online. All three services include software that you can install on your Mac or on a Windows PC (SpiderOak and DropBox also offer Linux versions, while SugarSync is also available for the iPhone and iPod touch). With this software installed, you can easily sync files between your computers and an online storage area. DropBox sets up a single folder (the eponymous DropBox) whose contents are automatically mirrored between your Mac and the DropBox servers. SpiderOak and SugarSync let you designate one or more existing folders to behave in the same way. In all three cases, new or modified files are uploaded automatically as soon as a change is detected in the folder(s). All three services offer file sharing and synching; SugarSync and DropBox also let you upload or delete files from a Web browser. If you’re not a MobileMe member, you can sync data from your iPhone with your Mac using iTunes—but that requires a physical connection. You can push sync contacts and calendars (in other words, the syncing happens automatically) without MobileMe, but it’s trickier. Use an Exchange Server The iPhone fully supports Exchange accounts, which provide push e-mail, contact, and calendar updates. On a Mac, you can access your Exchange account with Entourage; you can also access your Exchange e-mail with Apple’s Mail and (as described earlier) your Exchange address book with Apple’s Address Book. If your employer or school doesn’t already have an Exchange server, you can sign up for an individual account with several providers, including 4iPhone, interWays, mail2web, or SherWeb. Note that you don’t need to use actual Exchange servers; third-party servers that use Microsoft’s ActiveSync technology—such Kerio MailServer, Zimbra Collaboration Suite, and Communigate Pro—also offer push synchronization of e-mail, contacts, and calendars with your iPhone. If your organization uses, or is willing to set up, one of these packages, you can avoid signing up for a separate Exchange hosting package. Use NuevaSync NuevaSync is a free online service that offers over-the-air push syncing of contacts and calendars between your iPhone or iPod touch and Google (Gmail Contacts and Google Calendar), Plaxo (for contacts only), or both. After signing up for an account, follow the online instructions to set up your mobile device, and you’re all set. Athough NuevaSync can give you over-the-air push synchronization of contacts and calendars, it doesn’t sync directly with iCal or Address Book. To fill in that part of the puzzle, use BusySync, Spanning Sync, or Plaxo to sync data from your online account to your Mac. Although your data may take longer to sync, it can still happen automatically. MobileMe’s Gallery lets you create stunning online albums of photos and movies—either by publishing your media from iPhoto or iMovie, or by uploading files via a Web interface. Many photo-sharing sites offer comparable capabilities, although with somewhat less panache than Gallery. For example, a free Flickr account lets you upload 100MB of media per month (with unlimited total storage); a $25-per-year Pro account gives you unlimited photo and video uploads, as well as numerous other features. Smugmug presents your photos more stylishly than Flickr; accounts with unlimited storage start at $40 per year. 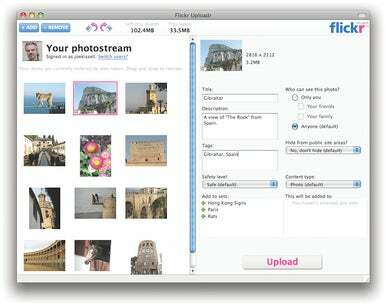 Instead of loading photos to MobileMe's Gallery, you can post them to Flickr using a utility like Flickr Uploadr. Both Flickr and Smugmug have Web interfaces for uploading photos, and optional Mac software to make the job easier. For Flickr, the free Flickr Uploadr lets you upload individual photos or entire folders, but you must do so outside iPhoto. To make things easier, you can use Connected Flow’s FlickrExport; it comes in versions for iPhoto ($17) and Aperture ($19; Lite version, free). After installing FlickrExport, select the photo(s) or album in iPhoto you want share and choose File: Export and click on the FlickrExport tab. Select the options you want and click on Export. For Smugmug, download the free MacDaddy application and configure it with your account information. Then go into the program’s iPhoto tab, select one or more albums, and click on Upload. Apple’s iWeb (part of iLife ‘08) lets you easily create template-based Web sites and publish them to your MobileMe account with just a couple of clicks. Even if you don’t use MobileMe, you can host an iWeb-created site on nearly any Web server—but doing so requires several extra steps. First, you’ll need an account with a Web hosting provider. You’ve got literally thousands of choices, but if you don’t already have a provider, I suggest going with one of the better-known and less-expensive hosting companies, such as Dreamhost or GoDaddy. Both offer basic hosting plans with prices starting at $5 per month. (They’re less expensive if you prepay for longer periods.) After signing up for an account, you’ll get login details—a server address, a username, and a password—for an FTP server. In iWeb, after creating or modifying a site, choose File: Publish to a Folder. Enter your site’s URL and select or create a folder to hold the files. Ordinarily, you must then upload the files with an FTP program such as Panic’s $30 Transmit or Nolobe’s $60 Interarchy. If you don't want to use MobileMe to host your iWeb sites, you can use Easy iWeb Publisher to post them to your Web host's FTP server. However, you can save a few steps with Plyxim’s free Easy iWeb Publisher ( ). After installing Easy iWeb Publisher, you set up a configuration that includes all the login information for your Web host’s FTP server. 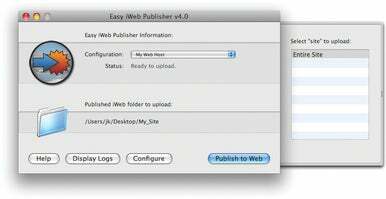 Then drag the published folder from iWeb onto the Easy iWeb Publisher icon and click on Publish to Web; the program uploads the files to the designated location on your Web server automatically.